The neighbors with the prowler had the police out today. The officer watched the videos from both incidents, wrote a description of the individual (it’s not certain, but everyone believes it’s been the same person each time), and plans to see if the details match up with any other reports. More on this if and when it comes available. The neighbor on the 3000 block of Stanford who reported the prowler last week now has captured video footage of the same prowler. 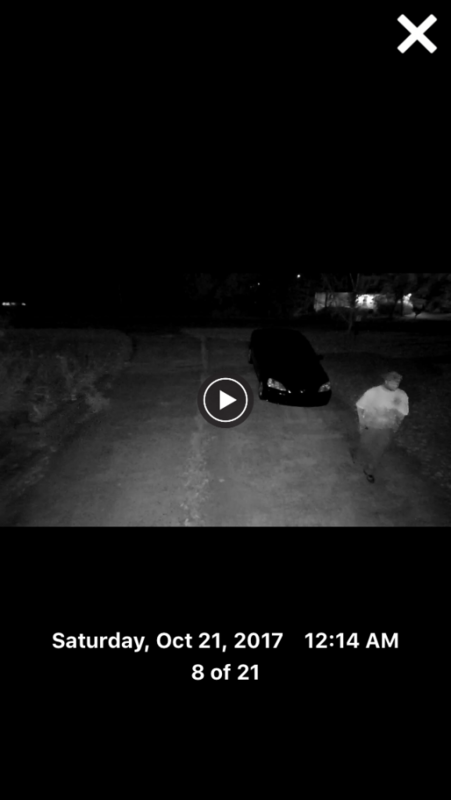 This footage (see below) was recorded at 10:30 p.m. last night (Thursday, 10/26). The neighbor plans once again to contact the police; an update will follow. Please keep your eyes open and report any suspicious behavior to police. Neighbors on the 3000 block of Stanford report that their camera caught a man walking down their driveway and under their deck at approximately 12:14 a.m. this (Saturday) morning. About 30 minutes later, their camera documented a police car driving by with spotlights on, so perhaps someone else noticed this individual and called the police. Below is a .png that shows the individual in question. The neighbors called the police this morning to report the incident. Although an officer came out to discuss, no report was filed because nothing was damaged or taken. Please keep your car doors locked, and be sure to report any suspicious behavior! A day or so ago I reported that a package that a neighbor believed was stolen had simply been misdelivered. After that post, I heard from another neighbor who reported a similar experience and requested that I write a follow-up post on this issue. Considering just how many packages are delivered these days, misdeliveries likely happen with some frequency. If you receive a package in error, then please either (1) pass it along to the correct neighbor in a timely fashion, or (2) contact the delivery service to inform them of their error. Waiting longer than about a day may result in a duplicate delivery, which will cost the intended recipient additional time, if not additional money. Earlier it was reported that a UPS delivery likely had been stolen from the Bexley cul-de-sac (3000 block) during the afternoon of Friday, July 1. The homeowner in question just received follow-up information from UPS, and it turns out that the package was delivered to the same house number on a different street in the neighborhood. It’s a pleasure to report that this was a false alarm. The item was delivered just a day prior to the break-in in the nearby Stanford cul-de-sac. The break-in on the Stanford cul-de-sac (3000 block) took place between the hours of 10 a.m. and 11:50 p.m. on Saturday, July 2. The residents were out of town and the break-in was discovered by their house sitter. The burglar(s) forced entry through the side porch door, and took primarily electronics and jewelry. A police report has been filed, but the police have not yet shared their report or any additional information with the residents.